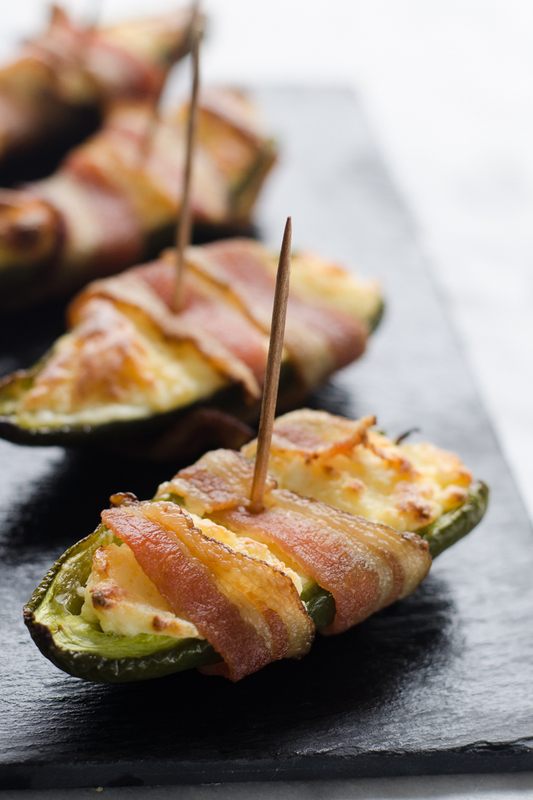 These Gluten Free Bacon Jalapeno Poppers are a super easy and disarmingly delicious appetizer! 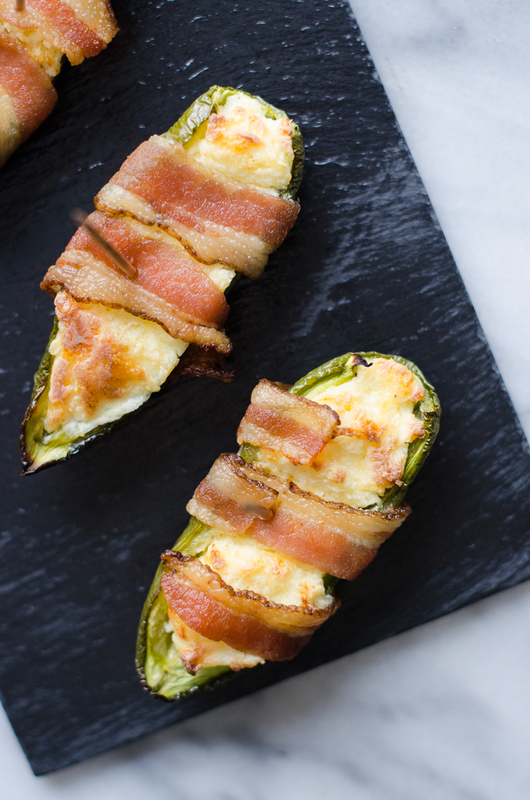 These Gluten Free Bacon Jalapeno Poppers taste AMAZING. When I was kid, my dad flipped for jalapeno poppers. Every once in a while he would drive to the grocery store in the podunk town close to us buy them. I wasn’t a fan. Even though they were fried (and every kid is supposed to love fried food, right?! ), the texture of the pepper threw me off. I basically hated peppers of any sort at that point. Plus they were a tad spicy, and, being a good northern Minnesotan, I couldn’t handle anything spicy. Fast forward to after I got married. After trying bacon jalapeno poppers at several restaurants, Reuben and I discovered that we really enjoyed them. By that time I had gotten over my disgust for peppers and spicy food. And: bacon, HELLO! We talked about recreating them at home but, to be honest, they sounded like A LOT of work. Deep frying food can be a major pain. Don’t get me wrong: I still do it now and then (I think deep fried food is one of Reuben’s love languages). But the thought of greasing up my kitchen for just an appetizer was not appealing. 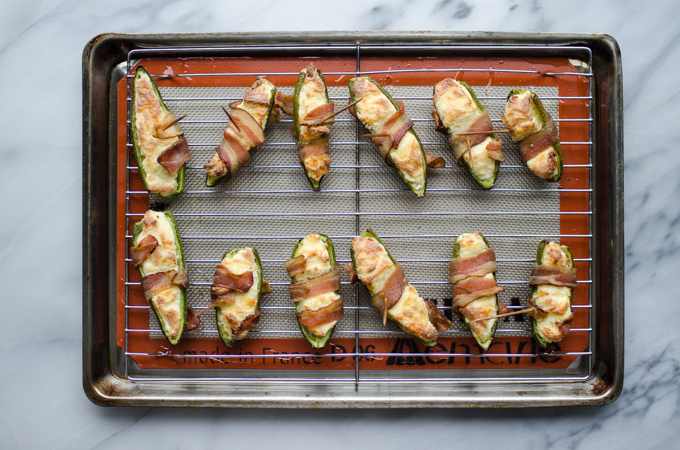 Then I saw a recipe for bacon wrapped jalapeno poppers. Bacon + no frying required = sold. 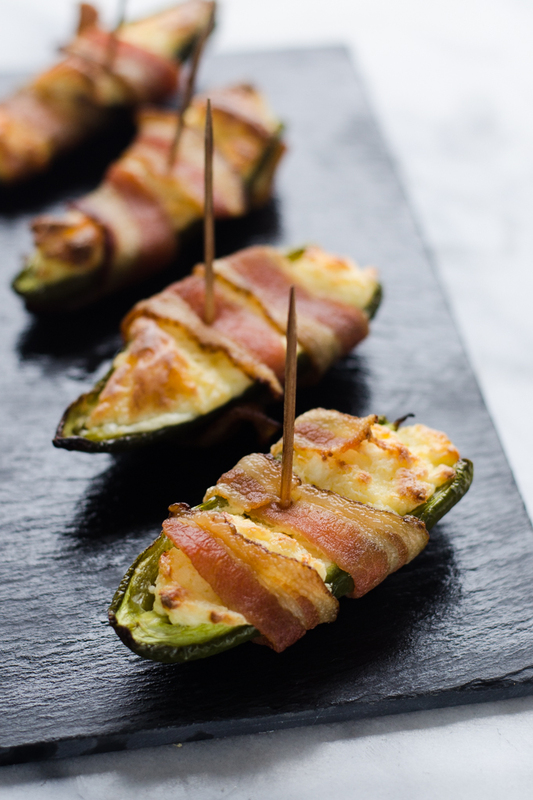 You only need 5 ingredients to make these jalapeno poppers (6 if you count salt). 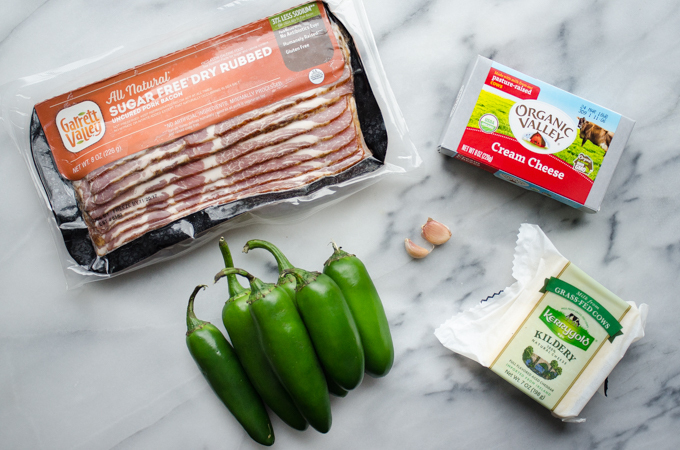 You know me: I chose natural bacon to make these healthier. I really like the sharpness of Kerrygold Kildery cheese, but any sharp cheddar should do the trick. One thing to note: japlapenos vary in spiciness. The key to controlling it is how well you clean them. If you are meticulous in scraping out ALL of the white membrane and removing every last seed, there should be very little spice. If you like that kick, leave a little more of the membrane and don’t fuss about the seeds. Mix together the cream cheese, cheese, garlic, and a pinch of salt. 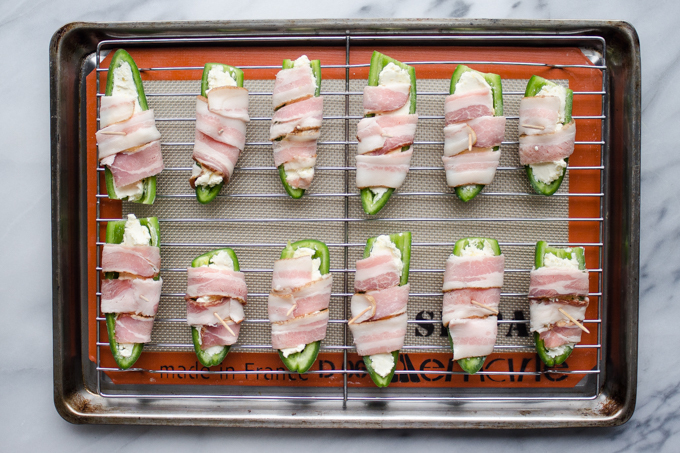 Squish that into the jalapeno halves and wrap them with bacon. Stick a toothpick in it to keep the bacon in place. This doubles as a great fork-free way to serve them! Now, don’t be stupid like me. Learn from my mistakes! I cut the pieces of bacon in half cross-wise. They were too fat, so I had to cut them in half lengthwise. Because I cut them in half cross-wise, they didn’t wrap around the jalapenos completely, and some of them fell off of the poppers while they baked. In other words: when I say cut the bacon in half, I mean lengthwise so the bacon is skinnier, not shorter. Anyway. P.S. If you’re making them for someone that avoids gluten, make sure all of your ingredients are gluten free! Some foods that should naturally be gluten free have gluten-containing additives, so read the label! Need another gluten free appetizer idea? How about my Pizza Stuffed Mushrooms? A super easy and naturally gluten free appetizer! Line 2 rimmed baking pans with parchment paper or a silpat silicone baking mat. Put a metal baking rack on top of each. Set aside. Preheat oven to 400 degrees F (205 C). Slice the top off of the jalapenos, cut them in half lengthwise, and scrape out the membrane (the more you remove, the less spicy the poppers will be) and remove the seeds. In a medium bowl, mix together the cream cheese, cheddar cheese, garlic, and salt. This can be done with a fork, a hand mixer, or in a stand mixer (for large batches). Squish the filling equally into the jalapeno halves. 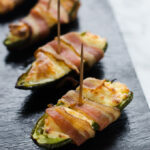 Wrap each jalapeno tightly with a slice of bacon. Stick a toothpick in the middle to hold everything in place. Put the poppers on the prepared baking-rack-lined baking sheets. Make sure they don't touch each other! Bake in preheated oven for 25-30 minutes, or until the bacon is nice and crispy. Allow to cool a bit before serving. Store any leftovers in an air-tight container in the refrigerator. Yes! You can assemble them are store in the fridge up to a day in advance and just bake when ready to serve.